This dish is wholesome and an interesting dish for children. They will love it. Take a pot. Add the coconut milk and condensed milk. Stir and let it simmer for 2 minutes. Add the oats. Stir and cook till it thickens. Add the gelatine and stir. Switch off the flame. Stir it and let it cool. Take a transparent glass bowl. Add few pieces of each colour jellies. Gently add the oats coconut pudding. 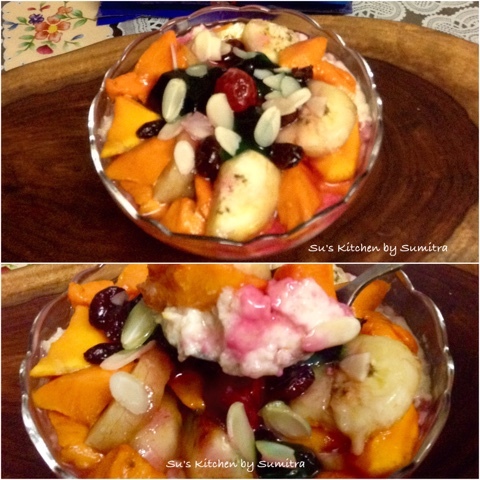 Add few mango and banana pieces. Add few cranberries. 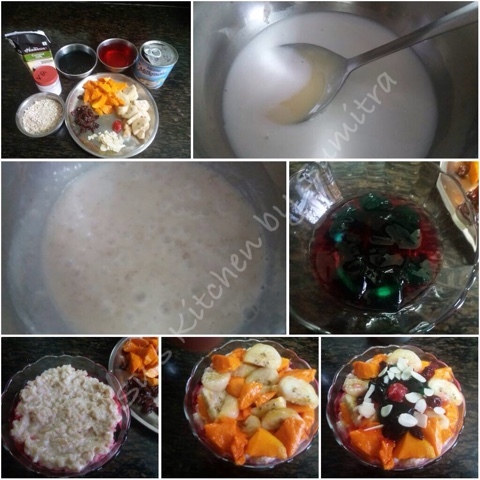 Add few pieces of the jellies again. Garnish with almond flakes and cherry. Chill in the fridge for 1 hour before serving.